A magnetic stripe card, also called swipe card or magstripe card, is a type of card capable of storing data by modifying the magnetism of tiny iron-based magnetic particles on a band of magnetic material on the card. It is read by swiping past a magnetic reading head. Magnetic stripe cards are used in credit cards, identity cards, and transportation tickets. They may also contain an RFID chip for access control or electronic payment. Magstripes divide into two main varieties: high-coercivity (HiCo) at 4000 Oe and 2750 Oe (most common), low-coercivity (LoCo) at 300 Oe. Coercivity means the magnetic material’s resistance to becoming demagnetized, it is usually measured in Oersted (Oe) units to indicate the magnetic stripe’s strength. HiCo and LoCo magstripes can be read by any card reader. A HiCo card writer may write both HiCo and LoCo cards, but a LoCo card writer may write only LoCo cards. Now, magstripes can be made on each Mifare smart card with a little cost. Magstripe additional cost. Lanyard, also called neck lanyard, badge lanyard, or ID lanyard, is a long piece of cord or strap worn around the neck, shoulder, or wrist to carry items such as name tag, badge, security pass, ID card, key, USB drive, whistle, flashlight, pen, and cell phone etc. Printed lanyards are a cheap promotional tool for advertising your company logo. They are durable, useful and capable to bring your message to the customer. A unique identifier (UID) is a numeric or alphanumeric string that is associated with a single entity within a given system. UID make it possible to address that entity so that it can be accessed and interacted with. A UID is different from “serial number” that UID is in Hexidecimal and a serial number is an integer number. There are many ways on how to turn the array of bytes into an Integer. In particularly a 4 byte Mifare UID, the most common way “Little Endian” or “Intel” reading method, that is starting from byte 3 to byte 0, and the converted decimal number matched the printed number on the card. UID is a common expression, defined in the ISO/IEC 14443-3. In some case, some terms like RID, NUID (FNUID and ONUID) are not unique. The 4-byte UID is also called “Single Size UID”. The 7-byte UID is also called “Double Size UID”. The 10-byte UID is also called “Triple Size UID”. Mifare Classic starts with a 4-byte UID, but the number of chips produced far exceeds the 4 bytes number (4,294,967,296) around 2012. The new Mifare Classic card is using 7-byte UID. UID can be used simply as an identifier in the Access Control application. More importantly, UID is used in applications to avoid fraudulence such as smart card store value prepayment. Do you have any idea which kind of ID card printer will best suit your needs? 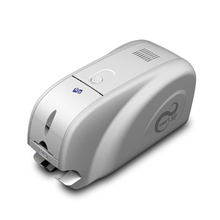 Imagine you’ve been assigned to find the best ID card printer for your company. What’s the best ID card printer available? The short answer: there isn’t a “best” printer. But the following highlighted points may make it simple to compare for your selection. also known as Edge to Edge Printing. Direct to Card is where the print-head comes in direct contact with the card. This printing type is the most popular today mostly because of the cost factor of the printer. also known as High Definition Printing or Over the Edge Printing. Reverse transfer print-head prints to a transfer film backward (hence the reverse) and then the printed film is rolled onto the card with intense heat (hence the transfer). Over the edge is because when the printer prints onto the film it has a bleed, so when rolled onto the card it’s completely over the edge leaving no border. It can be used for outstanding visual quality and durability. Choose the right model to handle your specific requirements. If you need to print on both sides, do not choose a single side printer. It will take you more than double the effort because a misprint or misarrangement will cause you the cost of the card. If there is a particular encoding technique requirement and the printing quantity is large, make your chosen printer has incorporated this function. There are really a lot of brands out there in the market. Take your time to study the reviews on the Internet based on your requirements. Access Control System – which is the best? An access control system is used for security purpose, including physical security and information security; it is the selective restriction of access to a place or into a network. It can help you to secure your facilities, assets, and networks. good reading distance and secure, still use in a lot of corporate offices and offices. Looks elegant with higher security and convenience. The drawback is that a small percentage of people have a bad fingerprint and cannot use it. Smart Card based payment systems have been introduced for more than 30 years; however, most people are still using cash payment even in well-developed countries. Why we want to introduce a smart card payment system into our daily life? This is a convenient way of making payment using your contactless smart card. You don’t need to move around with a bulky wallet full of cash and no more hassles of keying a PIN to approve transaction or signing receipts. This is a secure mode of payment that takes place between two devices. Mifare technology incorporates AES and DES/Triple-DES encryption standards, as well as an older proprietary encryption algorithm. This reduces the threat of hackers stealing valuable information. Tapping to pay is much more convenient than any other payment methods. Customers can use a contactless payment card without taking it out of the wallet. It increases customer satisfaction as waiting time is reduced. On the other hand, merchants can accept more payments during peak sales times. Businesses can reduce delays without having to hire extra staff. With contactless payments, businesses can optimize their loyalty programs and improve customer relationships. You can send loyalty, membership, special offers, and reward to your contactless smart card payment system. Check out AliExpress on Smart Card Payment Terminals. Should you choose Proximity Cards or Mifare cards? Proximity card, also known as Prox card, is a “contactless” smart card which can be read without inserting it into a reader device. Held near an electronic reader for a moment they enable the identification of an encoded number. The reader usually produces a beep or other sound to indicate the card has been read. Proximity card led by HID card has been widely used in the office door access and airport access control in the USA. MIFARE is NXP’s well-known brand. Mifare card has embedded integrated circuits in which the chip communicates with a card reader. Its main function is for storing data, storing values and authentication. Commonplace uses include transit tickets, school cards, passports, and bank cards etc. Mifare cards have much wider application use and the cost has been reduced significantly, that’s why nowadays people are moving to multi-function Mifare cards. Should You Print Your Own Company Badge or Outsource the work? This is a typical question faced by many companies or schools when they need an employee’s badge or student ID badge for door access or time attendance. When that happens, the critical question is – Is it best to print your ID badges in-house or outsource the task? Of course, in-house printing is convenience and you can print it anytime. Most printers are affordable and will output an ID in under 30 seconds. This enables you to create new IDs immediately, as well as replace lost ones. There is no need to contact your vendor and then wait a week or two for delivery. However, the quality of most low-end printer will have a difficult time to print on a thick contact-less smart card. Sometimes, the edge is misaligned and the color on the edge is fading. The blank application formated smart card can cost up to a dollar and it will be a waste to throw it away if the printing is not good enough. In the old days, it difficult to find a vendor that will print a couple of cards for you. With the advance of digital printing on the smart card industry, printing a few cards is very easy or low cost with very high quality. But the shipping may take longer. The Pig occupies the last (12th) position in the Chinese Zodiac. According to one myth, the Jade Emperor said the order would be decided by the order in which they arrived at his party. The pig was late because he overslept. In Chinese culture, pigs are the symbol of wealth. Their chubby faces and big ears are signs of fortune as well. By the Chinese zodiac, 2019 is a Year of the Pig and it is an Earth Pig year. The Chinese zodiac is part of Chinese astrology and folklore, it has influenced people’s lives since ancient times. Are you prepared for what 2019 will bring? Happy New Chinese Year 2019!